The Vancouver Condo Buzz » 300 Units SOLD OUT in Phase 1 > REGISTER for Phase 2 ONE PACIFIC Vancouver False Creek North Condos with 150 Homes Priced Under $350k! 300 units in Phase 1 were sold in the first release this Fall! Phase 2 at One Pacific Vancouver False Creek condos are coming soon, so stay tuned for more information! One Block to the Waterfront. The first project in the brand new False Creek Central Vancouver real estate neighbourhood, One Pacific Condos is just one block from everything that this beautiful city has to offer residents. From the seawall to Yaletown and from the Entertainment District to downtown Vancouver One Pacific condos is the place to be and be seen! The Riviera Deck at One Pacific Vancouver False Creek Central condos features a host of extraordinary five star amenities that includes a stunning overhanging glass swimming pool, hot tub, gourmet kitchen, tasting bar and even a grand dining hall for more formal events. On the Sky Garden level at One Pacific Vancouver False Creek Central condos, home owners will find a rooftop garden, barbeque and dining area that can be enjoyed year round. The luxury begins with the grand entry and lobby with concierge. It extends through out the amenities and into every suite with over height ceilings, air conditioning, integrated Miele appliances and a selection of opulent high end features and finishes. All of this, together with the on-site retail – a café, restaurant and a 25,000 square foot state of the art athletic club – ensures One Pacific Vancouver condo residents receive a genuine five star living experience within the heart of the city. The False Creek Vancouver One Pacific condos are brought to you by world class and leading local developer Concord Pacific. The presales includes 150 suites priced under $350,000! Get more information by registering on this page or by visiting LiveOnePacific.com. You can also visit the One Pacific Sales Centre located at the Concord Pacific presentation centre site at 88 Pacific Boulevard Vancouver (at Pacific and Carrall in downtown). The master plan for the North False Creek Vancouver neighbourhood is stunning. With 4 major developers revitalizing the False Creek North community, home owners will enjoy a proposed entertainment and sports district. One Pacific False Creek North condos is the largest portion of property in the core of this developing area and Concord Pacific itself is planning up to 13 to 15 highrises along the North False Creek and East False Creek districts in Vancouver West Side. 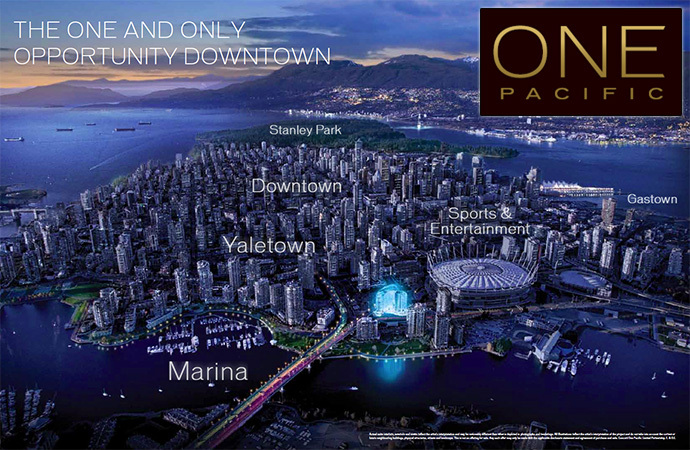 One Pacific False Creek North condos represents the first major development in this area and also, a ground level opportunity for prospective condominium buyers who want value and to get into the community early. Eventually, the North False Creek Vancouver area will be home to up to 25 new high-rise towers. This is the place to be! 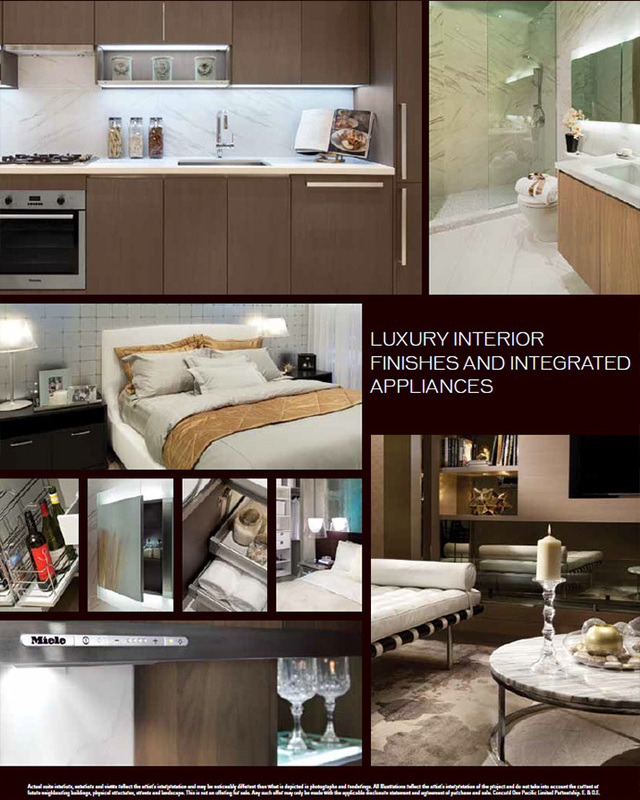 Luxury Interior Finishes and Integrated Appliances > And That’s Only the Start of It! You can own it all, right here at the premiere Vancouver One Pacific landmark condos. There’s both a ‘SMART’ as well as a ‘PREMIUM’ features list for home buyers seeking affordable luxury or premium prestige. The homes at One Pacific condos will feature 4 different interior colour palettes in addition to beautifully designed floor plans that have open balconies or terraces (most suites). In addition, the features for both smart and premium palettes include plush carpets in th bedrooms, roller shade window coverings, technology pre-wiring in every principle room, stacked front loading washer and dryer (Energy Star qualified washer) and ceiling heights at approximately 8’6”. In addition, all homes at One Pacific False Creek North condos will feature temperature controls for heating as well as air conditioning! Closet organizers will also be included. The smart palette has wide plank laminate floors whilst the premium package has engineered hardwood flooring. In addition, the laundry closet for the smart palette is porcelain tile while the premium is marble tiled flooring. As far as the ensuite bathrooms or first bathrooms are concerned, both the smart and premium features list includes engineered quartz stone counters, under mounted sink with polished chrome Kohler faucet, custom medicine cabinetry, mirror, shelves and built in lighting in addition to Kohler shower head, shower rod and dual flush toilet with soft close seat. The ‘smart’ bathroom will have laminate vanity with soft close door and slide out drawers in addition to large format porcelain tiled floors and tub/shower surround. The premium features at the presale Vancouver One Pacific False Creek North condos includes wood veneer vanity and marble tiled flooring and tub/shower surrounds. For the kitchens at the new One Pacific Vancouver condos in north False Creek real estate district, home owners who opt for the smart features will have laminate cabinetry with open glass display shelving and under cabinet lighting in addition to soft close hardware for cabinets, magic corner, recycling/garbage bin, engineered quartz stone counters, large format porcelain tiled backsplash, large single bowl stainless steel sink, polished chrome Kohler faucet and integrated appliance package (stainless steel). The premium features at the presale Vancouver One Pacific condos includes wood veneer cabinetry, marble backsplash and Miele appliances. One Address. Unlimited Possibilities. 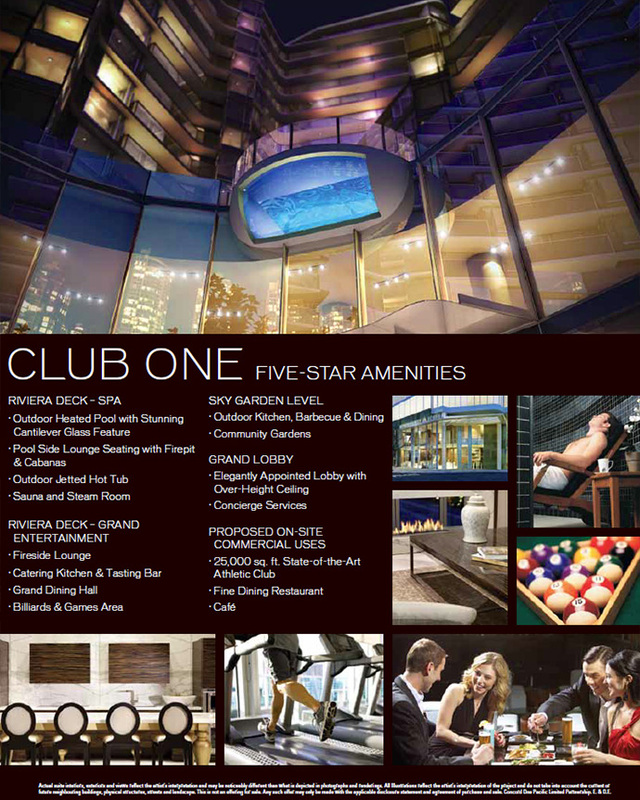 One of the most impressive features of this new False Creek North address is Club One which features five star amenities right on-site. There’s a proposed 25,000 square foot state of the art Athletic Club, fine dining restaurant and café on the retail level in addition to a grand entrance One Pacific lobby that is elegantly appointed with over height ceilings and concierge services. The Vancouver One Pacific Sky Garden level will include community gardens, outdoor kitchen, barbeque and dining space. The Riviera Deck at One Pacific Condos is for grand entertainment and includes a fireside lounge, billiards/games area, grand dining hall and catering kitchen/tasting bar. 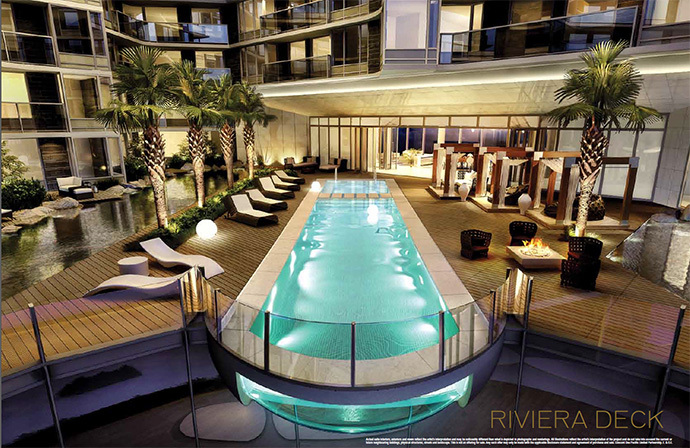 The Spa Deck at the Riviera Deck at One Pacific condos will feature a sauna and steam room, outdoor jetted hot tub, pool side lounge seating and fire pit with cabanas and an outdoor heated swimming pool with stunning cantilever glass feature and views! The location of the North False Creek Vancouver One Pacific towers is impeccable. 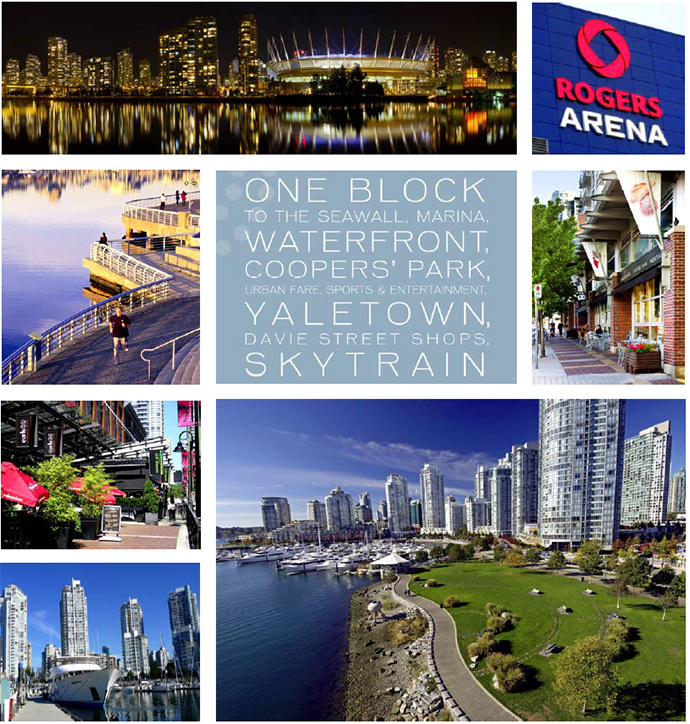 It’s one block to the Seawall, Marina District, waterfront, Cooper’s Park, Urban Fare, tonnes of sports and entertainment, large venues, Yaletown, Davie Street shopping and of course, the SkyTrain. Please note that this is subject to change at any time. The presale Phase 1 release at One Pacific Vancouver condos includes 1 bedroom and flex floor plans between 505 to 548 square feet between $309,900 to $350’s for Marina Facing or $348,900 to $360’s for Riviera Deck facing suites. The 1 bedroom plus enclosed balcony and flex space are slightly larger at 562 square feet and there is only the Riviera Deck facing option which ranges between $375,900 to the $390’s. The large 2 bed+flex and 2 Bed+enclosed balcony+flex space floor plans are between 783 to 1,093 square feet and are priced between $499,900 to $800’s for Marina Facing suites and between $599,900 to $640’s for the Riviera Deck facing units. Storage lockers are approximately 30 square feet and are available at $6,000. There may be a discount for the ‘Smart’ finishes. The prices at One Pacific Vancouver condos are exclusive of taxes and they don’t include parking or storage lockers. The regular parking stall is $50,000 while the small stall is $45,000. Visit www.liveonepacific.com for more details today.